Last Week in Review: There was mixed news from the housing sector, but a strong reading of second quarter Gross Domestic Product could be a good sign for the U.S. economy. Forecast for the Week: Look for key reports on housing, inflation, manufacturing and consumer spending. Plus, the September Jobs Report on Friday could be a market mover. View: Annoyed by flight delays and lost luggage? Check out these details from Kiplinger about travel insurance that can help. "I think I can. I think I can." The Little Engine That Could. After chugging along for some time, there's a sign that the U.S. economy may be gaining some much needed steam. The final reading of second quarter Gross Domestic Product (GDP) rose by 4.6 percent, led by a spike in exports and business investments. The reading, which matched estimates, was up from the previous reading of 4.2 percent for the second quarter. And, perhaps more importantly, the reading was up from the anemic -2.1 percent reading in the first quarter of this year. GDP measures the value of all goods and services produced by the U.S., and it is considered the broadest measure of economic activity. It will be important to see if readings for the third quarter of 2014 continue to move in this direction. There was mixed news from the housing sector, as August New Home Sales surged to the highest level since 2008, up 18 percent from July to an annualized rate of 504,000 units. This was the first gain in New Home Sales since May. 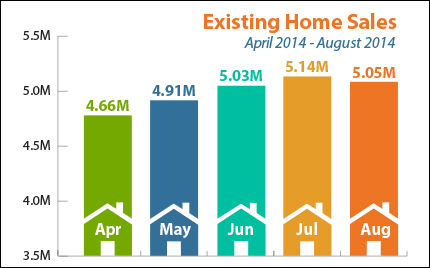 However, August Existing Home Sales declined by nearly 2 percent from July to an annual rate of 5.05 million units. This was the first decline in Existing Home Sales in five months, and was partly due to a decrease in all-cash sales. Also of note, uncertainty from the heightened tensions in the Mideast helped Bonds regain some recent losses, as investors shifted their money into the safe haven of U.S. Bonds. 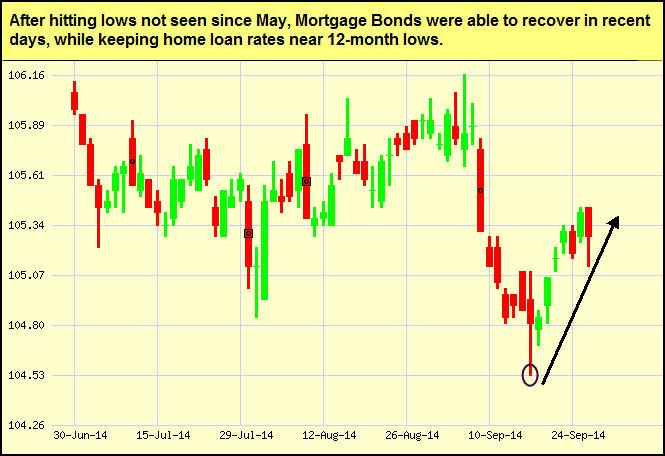 Since home loan rates are tied to Mortgage Bonds, rates also benefitted. A full economic calendar is in store, with readings on housing, jobs, manufacturing, inflation, consumer spending and more. Economic data kicks off on Monday with Personal Income, Personal Spending and Personal Consumption Expenditures (the Fed's favorite measure of inflation). In housing news, Pending Home Sales for August will be released on Monday. The S&P/Case-Shiller Home Price Index follows on Tuesday. Also on Tuesday, Consumer Confidence for September will be released. Look for manufacturing data on Tuesday via the Chicago PMI, followed by the ISM Index on Wednesday. The ISM Services Index, a national non-manufacturing index, will be released Friday. And last but certainly not least, Friday brings the September Jobs Report, which includes Non-farm Payrolls and the Unemployment Rate. Remember: Weak economic news normally causes money to flow out of Stocks and into Bonds, helping Bonds and home loan rates improve, while strong economic news normally has the opposite result. The chart below shows Mortgage Backed Securities (MBS), which are the type of Bond on which home loan rates are based. When you see these Bond prices moving higher, it means home loan rates are improving—and when they are moving lower, home loan rates are getting worse. To go one step further—a red "candle" means that MBS worsened during the day, while a green "candle" means MBS improved during the day. Depending on how dramatic the changes were on any given day, this can cause rate changes throughout the day, as well as on the rate sheets we start with each morning. As you can see in the chart below, Bonds and home loan rates improved in recent days, due in part to uncertainty overseas. I'll continue to monitor them closely. Who doesn't have a complaint about flight delays, lost luggage or getting trapped on the tarmac? Now there's insurance against these annoyances. Pay a flat fee of $25 for Berkshire Hathaway's AirCare policy, and instead of getting a headache, you'll get paid—as much as $1,000 in some cases. The company tracks your flight through a real-time monitoring system and instantly wires money to your bank account if your flight triggers a claim. Missing a connection because of a flight delay will net you $500; waiting longer than 12 hours for checked luggage, $500; sitting on the tarmac for longer than two hours, $1,000; and lost luggage, $1,000. Luggage claims require a photo of a baggage claim ticket. Otherwise, payouts are instant and cumulative. A long tarmac delay that leads to a missed connection? That's $1,500. Some credit cards provide limited travel insurance at no cost. And AirCare doesn't cover cancellations or medical emergencies, so it won't replace standard travel insurance. Before you buy: A recent monthly tally by the Department of Transportation shows that tarmac delays of more than two hours occurred in fewer than 1% of flights; 80% of flights took off on time. Reprinted with permission. All Contents ©2014 The Kiplinger Washington Editors. Kiplinger.com.